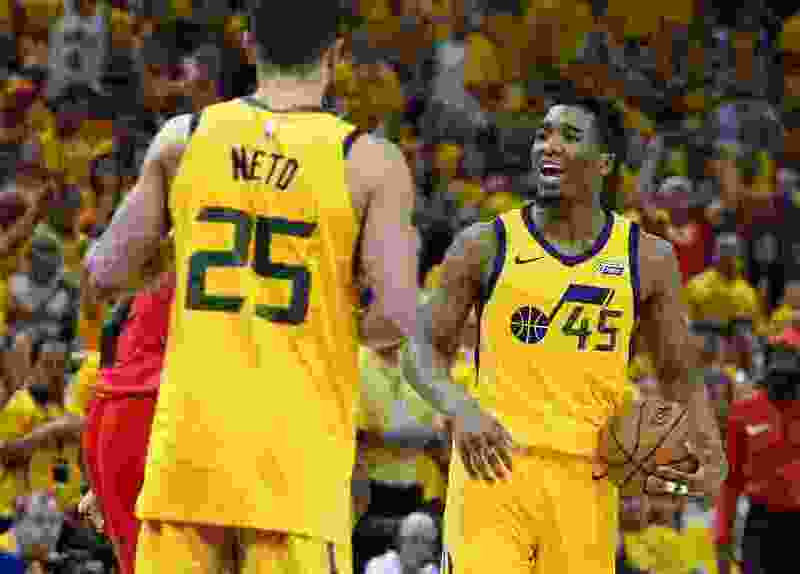 (Scott Sommerdorf | The Salt Lake Tribune) Utah Jazz guard Donovan Mitchell (45) jaws at Houston Rockets center Clint Capela (15) after the two grappled over a loose ball. The Rockets beat the Jazz 100-87, Sunday, May 6, 2018. But Mitchell is smart enough to know he will be treated differently; he’ll be at the top of opposition scouting reports. He also says he’s more “poised”, and more “relaxed” coming into the season this year, as opposed to last season where Mitchell’s youthful energy got him into occasional trouble. But he acknowledges that there’s an additional factor, too: playing the Kings on the road Wednesday is an easier test compared to what comes later in the week: a Friday home matchup on national TV against the defending champion Golden State Warriors. Grayson Allen thinks he might feel some of those first-game jitters. “I’m really excited for it to be my first official game now. I feel like I kind of got the nervousness of it out of the way, but we’ll see. When the game time comes I’ll probably be nervous, it’ll probably come back, but I’m just really excited to get this going,” Allen said. With the arrival of the regular season comes an entirely different schedule, too. Preseason is played at an almost collegiate pace: with five games in 23 training camp days, it’s very different than the regular season. Now, though, the Jazz play their first five games in an 11-day stretch. Allen, by the way, will see a familiar face in the opposition: rookie Marvin Bagley Jr., who also played for Duke last year. They talked after last Thursday’s preseason game against the Kings, though not since. Raul Neto will miss at least the next week with what the team is calling a right hamstring injury. He’s scheduled to be re-evaluated next Wednesday. Thabo Sefolosha is suspended for the first five games after violating the terms of the NBA’s Anti-Drug Program last season. For the Kings, former Jazz draftee Kosta Koufos is out with a hamstring strain of his own. Sharpshooting Bogdan Bogdanovic will also miss Wednesday’s game, he’s recovering from minor knee surgery.